Although Robert Mugabe was a tyrant, he was also apparently a stickler for constitutional procedure. He did everything by the book – while others cheated in elections and persecuted opponents on his behalf, he made sure that he appeared to be above reproach, partly by regularly rewriting the book to suit his requirements. The facade was thus paper-thin, but even as he clung to power he did so on the understanding that his position was above board. Although Donald Trump has shown himself to have autocratic instincts, he’s clearly no Mugabe. As Khizr Khan pointed out, it’s unlikely that he’s even familiar with the Constitution, and debatable whether or not he’s au fait with the distinction between the Senate and the Congress. (Neither am I, but I’m not even from the USA, let alone President of it.) His actions have confirmed again and again that he does not appreciate the separation of powers, but rather believes himself to be in total and unimpeachable authority over not just the executive but also the judicial and legislative branches. His governing medium is is not formal procedure, but Twitter, and he tweets not in the name of Potus, but Donald J. (as in, juvenile) Trump. The office of the President has existed since 1789. The holder of the office embodies the role: he or she is not more powerful than the State. Myriad checks and balances pertain to the position, restricting any attempt to impose absolute power. He or she is subservient to the Republic. There are numerous problems with this setup, all sorts of loopholes and imbalances which could if exploited maliciously be used to topple the whole edifice from within. The most explosive element would be a potus who was ignorant of and thus careless with the rights and responsibilities of the role. The current Republican Party, insofar as their intention was to detonate the structure of American democracy and install one or another of their kind in power in aeternum, chose well. How can we be sure that this is the case? In his recent tweet regarding the release of the three college basketball players, Trump, in his customary but still staggeringly infantile way, confirmed that he does not believe in the office to which he was elected. He insists that it was he, not the White House or the State Department, that chose to intervene on behalf of the players. The notion of himself an incumbent in an elected office rather than as absolute ruler does not even occur to him. Thus, any talk of the Republicans stealing the Presidency is misplaced. As things stand, the role of president is in abeyance. Trump regards himself as a dictator, with limitless power. This indicates that attempts to remove him through constitutional means will fail. Mugabe was at last persuaded to remove himself from an role that he ultimately respects. Getting rid of a man who doesn’t recognise that he’s only playing a role will be impossible – Trump is not going to give up being Donald Trump. As Lacan said, the madman is not only the beggar who believes himself to be King, buy also the King who believes himself to be King. (Note Trump’s prominent use of that word in the aforementioned tweet.) 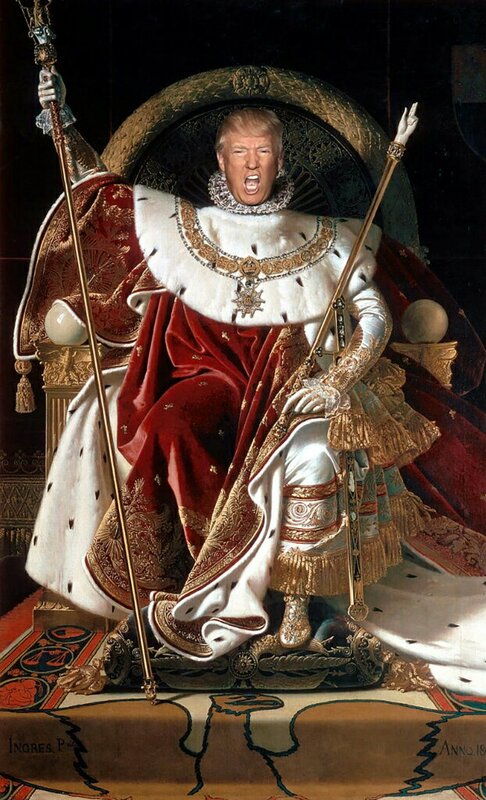 Trump will either die, or must be made to die, on the throne. I know exactly what you mean, Twitter is toxic, and terribly addictive, every time I go on a Twitter binge I spend most of the time in a furious mood. HAPPY THANKSGIVING!